One of the best activities in houseboating has to be to "drop the anchor" and spend some time in a secluded bay or protected anchorage. That's where the anchor line becomes a major player in that whole scenario. 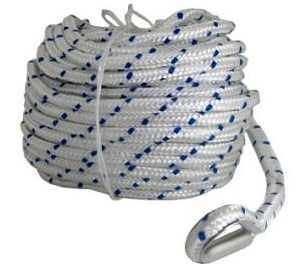 This is where having the proper amount (length) and diameter of anchor line is really critical to your families safety. Not having a suitable length nor sufficient diameter to handle the forces exerted can cause a dangerous situation. How much anchor line scope is safe? A commonly used "10 to 1" scope offers a good safety margin especially for overnight use. Therefore if you typically anchor in 20 feet of water, a "10 to 1" scope is 200ft, so a 300 foot anchor line should be adequate. The 135 page ebook is filled with tips, secrets, diagrams, and created to help you save time & money. * Diesel houseboats, and diesel boat manufacturers out there? * Houseboat Battery Chargers, what's the best marine charger? * Houseboat Generator Problems, my Koehler won't start or run.